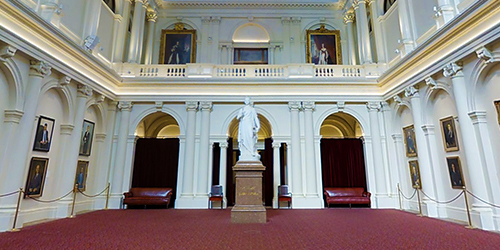 Take an online stroll through Victoria’s iconic Parliament House, one of Australia's oldest and most architecturally distinguished public buildings. In this series of interactive, 360° tours, use your desktop PC, smartphone or VR headset to explore some of the grand 19th Century spaces that evoke the spirit of our State’s goldrush era. Click on one of the links below to enter a room. Use the arrow keys on your keyboard to move about the space or click and drag with your mouse. For instructions on use with your VR headset and smartphone, click on the headset icon in the bottom-right corner when you enter a room. Queen’s Hall and the Vestibule provide a formal entry and meeting place between the two houses of parliament. They feature intricate mosaics, towering columns and some of parliament’s most significant artworks. 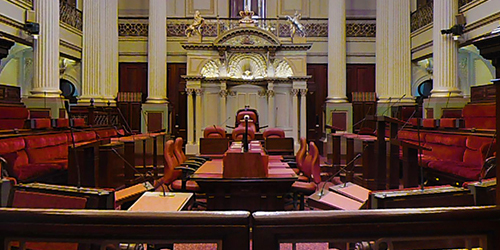 The decorative features of the Legislative Assembly model the traditions of the Westminster system of parliament. 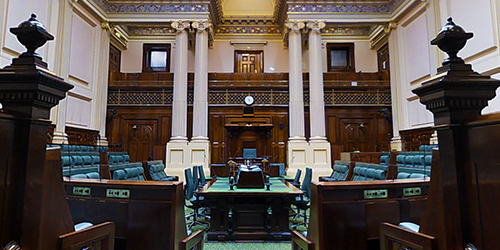 Its configuration has evolved to meet the needs of a growing state, and today it is the meeting place for Victoria’s 88 MPs. The chamber of the Legislative Council is home to both historical pieces of furniture and many unique architectural features, reflecting the customs of the UK parliament's House of Lords. Victoria’s 40 MLCs meet in this chamber. 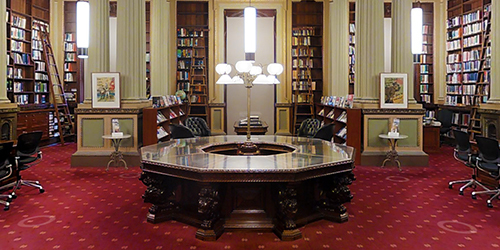 The Library is a highlight for visitors to Parliament House, notable for its grand crystal chandelier, central dome, curving staircases and vast collection of books and rare objects. Sophisticated and elegant, with dark timbers and accents of gold that convey 1920s sophistication. The dining rooms at Parliament House were gifted by the Federal Parliament, which met on Spring Street for 27 years before moving to Canberra. The Federation Room originally formed part of the Parliamentary Library. Today it is host to a range of meetings and functions. Named in honour of Parliament House architects, John Knight and Peter Kerr, the Knight Kerr Room regularly hosts meetings and parliamentary committee hearings. This is Parliament's largest meeting room, used frequently for parliamentary committee hearings and occasional functions and events. The work of the Victorian Parliament is also carried out at 55 St Andrews Place, behind Parliament House. This 3D tour shows the typical setup for a committee hearing, with markers included to describe the people who take part in this process. A bird’s eye view of restoration works at the top of Parliament House. A close-up look at the restoration of sculptures on the façade of Parliament House. Some of the finer stone details being restored on the façade of Parliament House. Explore the area where stonemasons are working on the restoration of Parliament House.